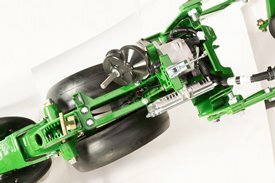 Two 56-V brushless electric motors provide John Deere ExactEmerge™ Planter row-units the upper hand over any other row-unit on the market. 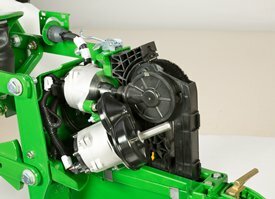 One motor controls the high-performance meter and the other powers the John Deere BrushBelt™ controls. Both feature a closed loop control with the John Deere ExactEmerge™ Planter row-unit controller, which ensures it turns at the correct rpm. The motor is controlled at a rate of 200 times per second. There is a control decision every 5 milliseconds. The controller also keeps each motor operating at independent speeds of each other. The meter speed is determined by a combination of ground speed and desired population rate while the BrushBelt speed must stay consistent with the forward ground speed of the planter in order to get the dead-drop of seed at the bottom of trench for optimum accuracy. Performance — Industry-proven 56-V brushless motors give confidence to the operator that the row-unit will perform in any condition. The advantage of 56-V over other electric motors on the market that only have 24-V is it takes a lot less amperage to power them. Amps are the force in electricity that applies the most stress and heat to the motor and its components. Brushless motors are maintenance free and give the producer the most optimal solution to achieve the highest performance and the lowest amount of work to the planter. Controlling input costs and improving productivity are key producer requirements. Manage seed output, reduce yield drag, and improve harvest capabilities are features built in to every John Deere Planter ExactEmerge row-unit with electric motor shutoffs. 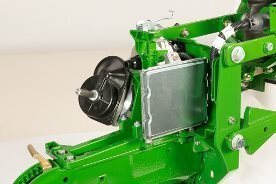 The electric drive version of John Deere Planter RowCommand™ row-unit has the potential to get 2 to 8 percent reduction in seed usage from being able to control the meter and John Deere PlanterBrushBelt rather than a clutch disengaging and some seeds still falling down the seed tube.